This book is based upon the famous lecture delivered before the Independent Religious Society, Chicago by Mangasarian. Born in Mashger (now within Turkey) in the Ottoman Empire, M. M. Mangasarian attended Robert College in Constantinople, and was ordained as minister in Marsovan in 1878. In about 1880 he enrolled at Princeton University. He was pastor at a Presbyterian church in Philadelphia from 1882 to 1885, when he resigned, becoming an independent preacher and a lecturer on "independent religion" in New York. In 1892 he became leader of the Ethical Culture Society of Chicago, a group established by Felix Adler. In 1900 he organized the Independent Religious Society of Chicago, a rationalist group, of which he remained pastor until 1925. He retired to Piedmont, California, where he lived for the rest of his life. During his life Mangasarian wrote a number of books. His most popular, including The Truth About Jesus — Is He a Myth? 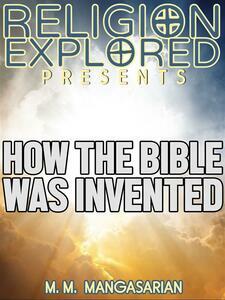 (1909) and The Bible Unveiled (1911), deal with the evidence against the existence of an historical Jesus. He also wrote hundreds of essays and lectures on questions of the times. His books and essays were translated into French, German, Spanish, and other foreign languages. The general subject of his writing was religious criticism and the philosophy of religion. Mangasarian considered himself a Rationalist or a Secularist not an Atheist, since he considered atheism a non-verifiable belief system.